Tenspeed Hero is truly excited to introduce you to Jennifer Haare. Jennifer has agreed to write a few posts for Tenspeed Hero thereby guiding us safely through autumn and Winter. We love her words, messages, and thought bubbles and feel lucky to be in conversation with her. We think her stories are best over coffee, and suitable with a stiff drink, and possibly staring at your iphone as you walk home from that midnight tavern. Welcome Jennifer Haare. JH: Tenspeed is like the cool smart kid who is also funny and everyone is friends with, except I had a dream where me and the kid were blessed by a Sami reindeer farmer and learned our destiny to be close friends who grow with and from one another, so now it is imperative to fulfill our destiny. Also being a Hero means I can give a really authentic performance of that Enrique Iglesias song. TSH: We hear you are the President of the Scandinavian Studies Club at the University of Illinois. Why join this club? JH: Eh- prime minister. Our club is really into singing Christmas songs year-round and eating snacks. Also Joakim Noah is wearing a viking helmet in his Twitter profile picture, so it’s kind of cool to like Scandinavia right now. TSH: Favorite club that you have been a member of? JH: This reminds me of Woody Allen quoting Groucho Marx “I wouldn’t want to be part of any club that would have someone like me as a member” Except that’s not how I feel. I’d like to be in a club where the only members are me. Actually I think I was. I had a club while I lived in Sweden that was the “Sunday paint your nails and listen to the new This American Life podcast” club. I invited a lot of people but they never came. It was a great club though. TSH: Your three favorite Swedish words? JH:barnbarn (grandchild) ô (island) & sjuksköterska (nurse). not to mention fika and lagom but those are everyone’s favorite words. 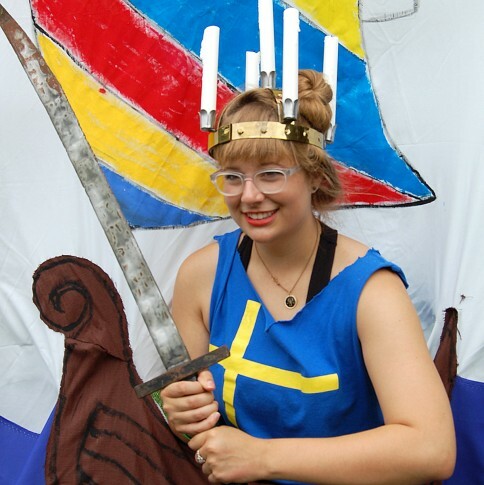 TSH: Why do you think so many Swedes emigrated to the midwest? JH: They wanted to try corn! Seriously! There is like no corn in Sweden! TSH: Three books we should be reading? 1) Wilson by Daniel Clowes. It’s that time of year. 2) The Atlas of Remote Islands by Judith Schlansky. It is non-fiction, a collection of 50 islands with varying descriptions of history, landscape and lore. at first I thought it was really creative fiction. It would make a nice coffee table or before-bed book. I bet you’d have neat dreams. 3) (not a book but) Shakespeare’s Titus Andronicus. Just the wildest play. T.S. Elliott said it was the stupidest most uninspired play ever written. There are so many atrocities committed. Riveting! TSH: Describe an obsolete vernacular? JH:Well, Wildcat was written in a kind of obsolete vernacular. Wildcat. Wiiiild cat. TSH: Walking or riding your bike? JH: I almost always choose my bike over walking or public transit because it’s faster (which means I can leave later) and more fun (I know it’s bad but I love zipping past zoned-out college kids and watching them whir around). Walking, for me, tends to promote mild existential crises, so I reserve it for special occasions. Last spring my bike was stolen so I walked everywhere for a while and I would listen to T-Pain’s “I’m in Luv (Wit a Stripper)” on repeat. TSH: Sleeping in or waking up early? JH: There’s something to be said about waking up early, eating a perfect breakfast, and going back to sleep: yes. TSH: Dream Job and you can’t say Tenspeed Hero because you are already hired? JH: Sought after writer lady who gets to travel the globe note-taking. Or scientist who finds a way to make Coca-Cola really really good for you. Tags: Copenhagen, jennifer haare, Jenny Haare. ← Philippe Gilbert is a World Champion! « Philippe Gilbert is a World Champion!